I stumbled upon this awesome concept; Samsung Galaxy S5 android smartphone with 3D Render, Features 2K Display, 64 Bit 8 Core CPU. The concept was designed by Raphael Warner with the believe that it will end up winning the top smartphone race in 2014. Below is the concept in pics as shared by concept phones. 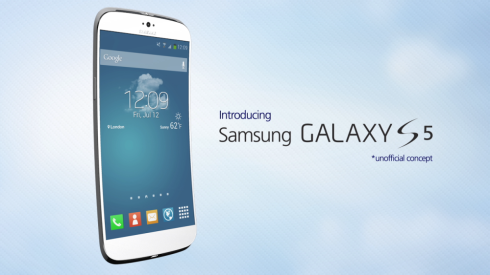 It is expected to come with a slightly curved case and an aluminum body. 2K HD Super AMOLED screen with a resolution of 2560 x 1440 pixels is one of the features it’s expected to be saddled with, alongside a 5 inch screen with a 587 PPI density. 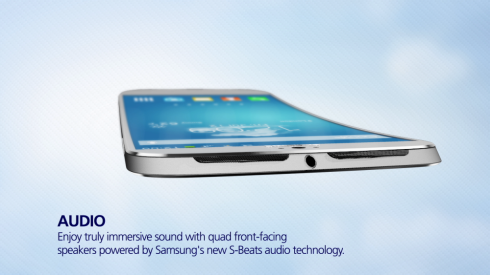 Flexible chassis, that flexes up to 30 degrees is another feature of the smartphone . The awesome device is also saddled with Android 4.4 KitKat Operating System (OS) with TouchWiz User-interface (UI) and a 64 bit octa core processor, 3 GB of RAM and a 4000 mAh battery. The camera also is a 16 megapixel one with a huge lens, 4K video capture and the designer also integrated quad front facing speakers for excellent acoustics. What’s your thought about this awesome android device? Drop that in the comments section below, do not forget to share with friends.